3 November: Alberon was a son of Count Anulphs of Chiny and in 1131 was made bishop of Verdun. He was a companion of the holy founders Bernard and Norbert and in 1138 resolved, with the aid of religious from Prémontré to turn the Benedictine monastery of St. Paul in Verdun into a house of Premonstratensians. He resigned the episcopate in 1156 and became a Premonstratensian at St. Paul’s. He lived for two years in the utmost simplicity and humility as a devote follower of the Rule. As he had predicted as died on the 2nd November 1158 whilst reciting the psalms. He was immediately regarded as a saint. On hearing of Alberon’s death St. Bernard celebrated not a Requiem, but the High Mass of Confessors. He rests in Verdun Cathedral. 4 November: John Sausenthaler Abbot of Ursberg, elected in 1595. The records of the abbey show that he was an exemplary priest and a devoted abbot. He made his best efforts to preserve the canonical discipline in a time of great unrest and confusion amidst the wars of religion. He introduced the new ‘vita comunis’ in his circary and also forbade the ownership of private property. The Bishop of Augsberg put himself under the spiritual direction of John and spent some time each year making spiritual exercises in the abbey. 6 November: Berengar and his brother Konrad were knights of emperor Fredrick Barbarossa who established an abbey in Schussenried in 1183 from their own estates. Premonstratensians came to this abbey from Wessenau and Berengar lived there as a lay brother performing all the offices proper to a brother. After his death in 1188 he was buried in his grey habit in the same grave as the first provost, Fredrick. In Schussenried he is regarded as ‘Blessed’. When his tomb was opened in 1631 he was found incorrupt. 6 November: Martin Van den Hecke Abbot. Canon of Dieleghem near Brussels who was born in Tessenderlo. He lived in the restless times of the wars of religion and in 1586 the Protestants destroyed the abbey. Martin became a priest of koersel, a parish of Averbode. 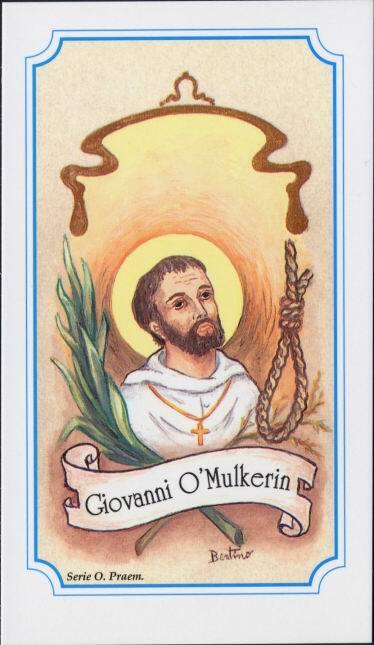 The good priest was taken hostage by the Protestants and tortured so severely that he was near death. Once the situation in Dieleghem has improved he was able to return to the abbey and was appointed priest of Wolvertem. In this brief period of calm he was elected abbot in 1603. He was a great leader of the community and regulated the canonical life within his abbey, taking care that each precept of the Order was carefully observed. He was full of humility and always to be found at the service of his brethren. He had a great love for ‘lectio divina’, read the Fathers of the Church and mediated upon and wrote of the Passion and Death of Our Lord. He often thought of the End Times, of the end of Man and the world to come. At midnight he regularly prayed for two hours, often he was found prostrate upon the simple grave he had dug for himself before his death. He was 78 years old when he died on 6 November 1623, having served as abbot for 20. 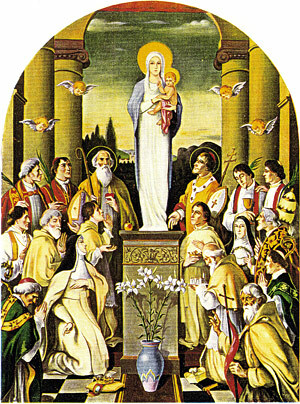 8 November: Aegidius de Marle and 26 Companions Martyrs. Norbertines of the Abbey at Acre. St John at Acre was the home to Premonstratensians who had fled the houses of St. Habbakuk and St. Samuel after attacks by Moslem forces which had killed the majority of religious. Those who fled came to Acre which itself fell at the hands of Saladin. On November 8th 1291 Abbot Aegidius was cut into pieces before the eyes of his brethren so as to induce them to renounce their faith, none did so and thus they went to their deaths as martyrs for the faith of Christ. 10 November: Diego of Mendieta The last abbot to be elected ‘for life’ of St. Saturninus, Medina del Campo in Spain. He resigned spontaneously from his office and thereafter decreed that abbots were to be elected for three year terms. He was elected abbot once more in 1591. He was a convinced follower of the reforms of Pope Saint Pius Vth and as General Visitor of the Order and Abbot for three year terms in other abbeys, he introduced reforms with mild determination. This saintly priest was a humble apostle, obedient and peaceable. At his death, aged 81, in 1588 his brethren and the people swamped his coffin to gather pieces of his habit as holy relics. 11 November: Daniel Van Campenhout Daniel was born in Ossel and became a Premonstratensian of Grimbergen. Abbot Van Wayenberge (1505-1540) desired to implement the new statues of 1505 but found he was without sufficient religious and therefore asked the religious of the Saxon Circary for aid. It was in Daniel that he found himself aided in this task by a man with exceptional talents. Daniel was appointed novice master and then Prior. There was such success that in time other enthusiastic members of the Order were attracted. Daniel was a man of God who loved interior silence and practices penance by harsh physical penances. His contemporaries reported that when he celebrated Mass they had seen him assisted by two angels. He was not of this world and frequently concourse with the angels and experienced many ecstasies. He died in the odour of sanctity on November 11th 1532 and was immediately regarded as a saint. Abbot Outers erected an effigy over his tomb with represents Daniel assisted at Mass by the angels. His likeness also appears at the choir stalls of the abbey where the saints of the order are represented. 11 November: John De Bevaye He was born in Maubeuge and became a canon of Vicogne where he was elected abbot in 1279. He was a model of the discipline of the Order in which he moulded his brethren exactly. In as far as his office allowed he performed all the works of the other canons. He was especially zealous of chastity and carefully avoided any deeds or bad conversation that could lead to danger. He regularly subjected himself to sever penances and at table often only took bread and water. His reputation grew to such stature that he was even able to resist the attacks on the freedom of the Church that were then being made by Count John of Avesnes. He died in 1290. 12 November: Fegeringus was a Premonstratensian of Wadgassen in Saargebiet and a student of the first Abbot, Wolfram. After Wolfram’s death in 1158 he himself was elected abbot. Fergeringus was especially known for his concern for the poor and he maintained a hospital where the needy and pilgrims were able to find accommodation. He died in 1169, having directed the abbey in goodness and modesty. 14 November: Today, in the Premonstratensian Missal, in the Feast of All the Relics of the Churches of the Order, but in the modern calendar of the Order it is observed as the memorial of St. Siard (17th November in the Premonstratensian missal). Saint Siard of Friesland (who died in 1230) was a holy abbot of the Norbertine Abbey in Mariëngaard by Hallum in Friesland. He was born to a noble Frisian family in the shadow of the abbey of Mariëngaard and there received the white habit at the hands of St. Frederick. During his first twenty years in the abbey Siard practised great penances and mortification and proved a model of edification for the brethren, to such an extent that Abbot John appointed Siard his successor on his death-bed. As Abbot his life was particularly marked by its austerity and benevolence. He was particularly fond of handing out bread to the poor personally and joined in with the manual labour of his brethren, particularly in the fields harvesting wheat. He was extremely open to those who sought his advice and ensured that the abbey became known as a place of refuge throughout the region. As a model of perfection, St. Siard had also given Blessed Dodo of Haskerland his Norbertine education. He also showed a true conciliatory spirit, settling disputes quickly and with the utmost gentleness and understanding. Furthermore the saint extended the lands of the abbey and guided the construction of various additions to the buildings. Once on a journey, the holy abbot came across a noisy celebration of music and dance. He stopped and turned to his brothers saying, “Just imagine what songs of joy the angel choirs must sing when they celebrate the conversion of a single sinner.” Known also for his miracles of healing, the monastery began to attract many in search of physical healing after Siard cured a man of blindness. Naturally the austere life that Siard had implemented was not popular with all of the canons and in 1290 one of their number attempted to murder the abbot. His loud cries brought the aid of the confreres and he escaped with only minor injuries. He died the same year, on November 13th. The relics of St. Siard were first kept in the sacristy of Mariëngaard abbey and latterly moved to the choir. When the abbey was destroyed by Calvinists, his relics were brought to Hildesheim by Siardus of Hensema, a Friesian nobleman. One reliquary (containing the skull and almost half the bones) came to the abbey of St. Feuillien in the town of Roeulx in Hannonia and after the French Revolution then rested in Strépy. On 24 February 1938 these relics were then solemnly transferred to the abbey of Leffe. A second reliquary was brought into the possession of Tongerlo Abbey in 1617. The transfer was preceded by a long journey, during which the relics were received and venerated at various Norbertine abbeys, finally resting at Tongerlo on 6 July 1617. In 1619 Prelate Stalpaerts built a beautiful shrine where the relics were houses. When Tongerlo also suffered under the Revolution, the relics were safely hidden and returned to the abbey in 1860. 18 November: Gerung was sent by St. Norbert first to Ursberg, then to Roggenburg in Swabia where he founded an abbey in 1130. He overcame all his difficulties with his unswerving devotion to Our Lady. After 40 years under his leadership, the new foundation had experienced a steady growth, he died on 18 November 1170. 21 November: John O’Mulkerin, abbot of Lough Cé in Ireland. Arrested in 1580 together with a Cistercian abbot. Taken to Dublin Castle where he was imprisioned and tortured on account on his faith. At their trial they maintained their defence of the Catholic Faith and both were hanged on this day in 1580. 22 November: John D’Avesnes In 1544 he was elected abbot of Ninove. He was a good religious man, who was especially devoted to the poor. Children of poor families were given scholarships by him to study either at the College in Leuven, or in another institution. John was a humble priest content with common sense, he avoided all pomp and made do with normal food and basic clothing. After a 24-year-long reign, he resigned in 1567. He died on this day in 1571. 23 November: Detlev von Parkentin. Canon of Ratzeburg and from 1395 bishop thereof. 24 November: Johannes Geysler. Canon of Steingaden. Executed for his faith in 1642 by the Swedish armies then ravaging Bavaria. 24 November: Johannes Pecher. Abbot of Tepl from 1629. Tortured by the Swedish who dragged him across the country in chains. He died in 1647. 24 November: Norbert Hoecht. Canon of Windberg. Parish priest. When the Swedes invaded Bavaria he was killed whilst holding in his hands the cross of Christ. 26 November: Adam Rusdrig. Abbot of Tepl from 1598 and also provost of the canonesses at Chotieschau. He twice saved the sisters canonry from destruction by heretics and also stopped its buildings being seized by the Jesuits who wishes to fund their own foundations. When the Protestants attacked Chotieschau he saved the sisters but was himself caught. He underwent terrible tortures for his faith and received the crown of martyrdom in 1633. 26 November: Konrad. Canon and Bishop of Ratzeburg. He led his diocese with wisdom and devotion until his death on 26 November 1291.